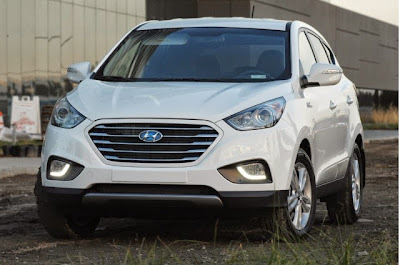 There have already been more Hyundai Tucson Fuel Cell vehicles leased in the U.S. than any other hydrogen-powered vehicle. Through April, Hyundai has leased 68 of the small SUVs since last June, when the first one was delivered. That slightly exceeds the number of Honda FCX Clarity fuel-cell sedans leased from 2008 through April. We spoke to early lessees in the U.S. and Canada to find out how they felt about driving on hydrogen and what kinds of experiences they'd had. In the U.S., Paul Berkman has now had his Tucson Fuel Cell for six months, and he's covered 9,300 miles traveling among the three restaurants and the bed-and-breakfast he owns and operates. His home in Corona del Mar, California, is only a few miles from three separate hydrogen fueling stations--one of the qualifications for leasing a fuel-cell vehicle in the first place. In Canada, Clayton Crawley and Jennifer Ma together leased the country's very first hydrogen-powered Hyundai in February. The Vancouver, British Columbia, couple kicked off a roster of what will ultimately be about 30 leases in B.C. Both Berkman and the Crawley-Ma household report that refueling with hydrogen is relatively mundane. The main differences: The pump looks futuristic, and the nozzle gets cold during the process (on account of the very low temperatures at which the hydrogen is stored). Berkman notes, however, that the heavily promoted "three-minute refueling" generally takes closer to 10 minutes. He's never once completed a fill-up in less than three minutes, he says. The pair of hydrogen pioneers also lauded the practicality and utility of the Tucson compact crossover. Crawley and Ma said that design gave them confidence they could use the vehicle for camping trips with their two children and a dog. He specifically mentioned feeling the Tucson Fuel Cell had been designed to fit their lives, and that they wouldn't need to make any compromises or adjustments in their routines to use the vehicle. Similarly, Berkman liked the high SUV seating position, its comfortable seats, and the outward visibility--a particularly important point for him--along with the intuitive controls and its lack of electronic bells and whistles. At 66, he said, he simply prefers not to have to learn those kinds of systems. He also praised the smoothness and quiet ride. At one point, Berkmansaid, his Hyundai dealer loaned him a top-end gasoline Tucson loaded with options--"and it was really noisy!" "I don't think I want a gas car ever again," he mused. As well as accessibility to rare hydrogen fueling stations, the early lessees appear to have an affinity for advanced-technology vehicles. Crawley and Ma had looked into plug-in electric vehicles, but hadn't found one which met all their family's needs – cabin space, in particular. 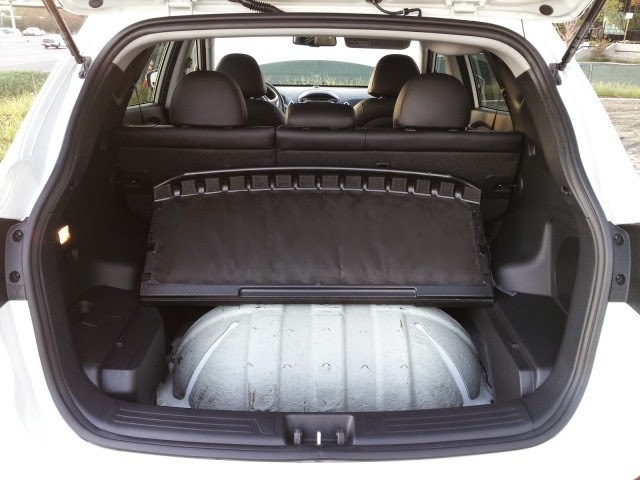 Aside from a cargo floor that's an inch higher (and no spare tire), the hydrogen Tucson retains the space of its gasoline counterpart. Berkman had owned a first-generation Honda Insight hybrid two-seater, although after going through six high-voltage batteries on a 2009 Honda Civic Hybrid, he gave up on that brand's hybrids. "Never again," he said. His second car at the moment is a 2009 Ford Escape Hybrid SUV. "I never looked at Hyundai," he said. "It wasn't even on my radar." "But I've always wanted to be ahead of the curve," Berkman said of the cars he has driven. The favorable impressions to the everyday utility of the Tucson Fuel Cell largely match the reactions of automotive journalists to the little zero-emission SUV. Berkman did mention a distinct lack of performance at highway speeds--which some reviewers apparently didn't notice, especially if they drove it only on local and regional routes. That lack of power at speed was also a frequent complaint in Tucson Fuel Cell owner group surveys, Berkman said. While he praises its instant acceleration from a stop, he says he's learned what the car is and isn't capable of. "I simply got used to the car, and I drive accordingly," he said. Crawley and Ma similarly enthused about the low-speed torque. They also noted that the car's silence can lead them to exceed highway speed limits without noticing, unless they keep an eye on the speedometer. Finally, the couple also notes that driving a hydrogen fuel-cell vehicle has led to them to look at other choices they make around energy use. Berkman says that while he wouldn't presently buy a hydrogen vehicle, he is confident that the capability of future hydrogen cars will exceed those offered in these early days. "They can squeeze out more range, it's easy for them to do," he suggested. "They'll figure it out." The Hyundai Tucson Fuel Cell is rated at 270 miles of range; the most Berkman has seen thus far is 290 miles, driving conservatively. 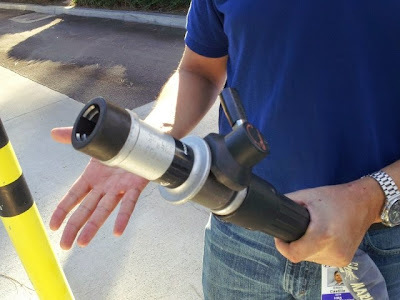 But, he said, he refills his car when the fuel gauge reads 3/4 to 1/2 full, just to guard against the chance that one or two of his three local hydrogen stations is not working--as has been the case over the several months since he took delivery of the car.